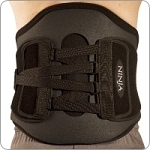 LARGEST SELECTION of discounted Back Braces, Lumbar Supports, Back Supports, Lumbar Braces, TLSO Braces Supports, Sacro Iliac Supports Braces, Spine Braces, Spine Supports, and Lumbar Sacral Support Braces. LOWEST SHIPPING COST GUARANTEED. BOA with Chairback provides exceptional support from T9 - S1. The modular construction of this brace allows for a three stage treatment regimen. Stage 1 involves post-operative use of the BOA with the rigid chairback piece, compression belt, and rigid anterior panel. Stage 2 involves the removal of the chairback piece for compressive support during a progressive rehabilitation protocol. Finally, Stage 3 involves removing the rigid anterior panel.